Okay, I know that I’ve already written an article with that title, but I couldn’t come up with a better one for this one. The reason is I still know that many reading this are having a problem understanding why we need a boat like this. The above picture is a 72-foot Gullet made in Turkey. These boats are made from pinewood and with a little teak trim And they take a lot of maintenance meaning that once we purchase such a boat we will be needing help from Believers to come and be part of the Ministry from time to time. That would be for the most part a working vacation. A new Gullet like the one above cost anywhere from 300,000 to $1 million, but a used one around 10 to 15 years old can be found for around 200,000. That is a fraction of what a ship or fiberglass yacht that size would cost. But more important it is what this ministry needs for the job it has to do. 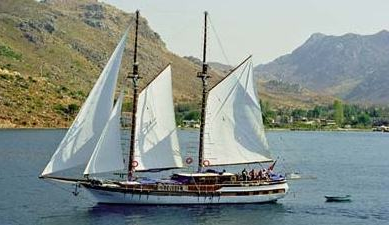 These Gullets are very common in the Eastern Mediterranean Sea and are seen pulling into and out of Turkish ports daily. And that is the very reason we need this type of boat. A boat this size could easily carry 30 to 40 from Turkey to Israel, they are used mostly for the charter business where they take large groups up and down the Turkish coast line. A boat like this would cause no unnecessary suspicion when pulling into Turkish or Greek Ports. That will be very important for when it becomes necessary to work underground you need such a cover. The boat we now have is wonderful and we love it, it is a great sailing boat, but it will only carry around 8 to 12 people on such a trip. Far to small for what is coming at us from Europe, and I believe the day is coming far sooner than we think to have this part of the ministry in tact. I would of course not put a picture of the boat we now have or the larger one we will be buying for reasons of security. But I can say I believe it will be a Turkish Gullet, and that means there are thousand of them to be looking at. The smaller one we now have is perfect for pilot trips into Turkey and Cyprus making very valuable contacts. Most of those trips are made by Joel and others while I stay close to the ministry here in Israel, I do arrange all their contacts in the places I send them. Connie and I have made trips and will from time to time do so but most of them don’t require our presence. Some have said to me that I am just trying to get a larger boat for ourselves, That couldn’t be further from the facts or the truth. The boat we now have is absolutely perfect if all we wanted is a sailing boat. A lager boat or I should say a Gullet means lots of headaches and expensive to maintain. The mooring in a marina would be at least double what we are now paying, fuel for a gullet runs into some big dollars and in general the work on such a boat never stops. When we do purchase this boat we will absolutely need Believers to rotate on it, and I don’t think that will be hard to organize, in fact, more are willing to do that rather then reaching into their pockets to purchase it. But they are willing to give what they have to give, their time and expertise. But many of the Believers who come can be trained to the point they can be used in setting up safe houses throughout Turkey and elsewhere. By training I mean to learn the politics, religion and mentality of the people of the different regions we will be traveling through. In the mean time we are very busy with contacts in Turkey, Cyprus and elsewhere making arrangements for future safe houses and routes to make it possible for Jews to reach the boat on the Eastern Turkish coast line to be brought to Israel. The work here in Israel has been under way in the Knesset, recently Connie and I spend another long day in the Knesset for this very reason. The Department of Aliyah needs to know under certain circumstances some regulations must be relaxed and we have been able to speak to most of the right people. There is still much to be done and God is opening doors by the power of the Ruach Ha Koddesh (Holy Spirit). We were about half way to the buying point but have slipped backwards some because of the need to finance trips to prepare the groundwork for that is as important to this part of the ministry as purchasing the boat. In fact, it is hard to say which is more important buying the boat or the groundwork. The boat would be worth nothing without things in place to pick up Jews, The groundwork would be worthless without the boat. For me it has been a balancing act trying to bring it all along at the same time. I know of a few others who are in the process of buying ships or boats to rescue Jews but they have no groundwork. I some times believe that much of what we are organizing in Turkey will be used by others who still haven’t seen the importance of that aspect of the ministry. I have asked several who I believe I can trust to stay close for we will be able to assist them in their efforts should they ever get their boats. While talking with other Jews who have boats here in Israel I am always interviewing them without them knowing it for when the time come I need to know who to speak to that might be willing to join us with their boats. During the 80’s I established the Middle East Gospel Ship and had ministry all over the Eastern Med knowing at the time that God was blessing the ministry in wonderful ways. But now that I look back I know it was a training ground for end time ministry and today all those contacts and the knowledge gained is so very important to what God is calling us to do. You see God never does anything in our lives with a singular purpose, He knows the beginning from the end and is way ahead of us in all things. When God gave me this vision and began to show me what I must be about, I thought I couldn’t have heard that from God, that surely He could find someone else who would be better fit for the job. But He did choose me and I have accepted the calling. I have been ridiculed, called names like “crazy” “nuts” and many much worse. I some times feel a little like Noah and understand his feeling possibly far greater than others. But I won’t quit and we will succeed, and Jewish lives will be saved because others that God has joined to this ministry heard that small still voice as I did. And like I, they have put their hands to the plow and know that God is leading by His Spirit. If everyone reading this would give all they can as a one time sacrificial gift that boat would be a reality in weeks. And the rest of this ministry would not have to struggle so much. Will you pray, that is all I am asking you to do is pray and ask God what would He have you do. Pray for the peace of Jerusalem, for our son Joel, and all the IDF soldiers. Pray for all those who have come to fight the Islamic enemy. Pray for this Ministry and your part in it.